Namibia is a year-round destination, but its climate varies depending on which topographical region you visit: the western Namib Desert, the Central Plateau, the Kalahari region in the east, or the Kavango and Caprivi regions in the northeast. 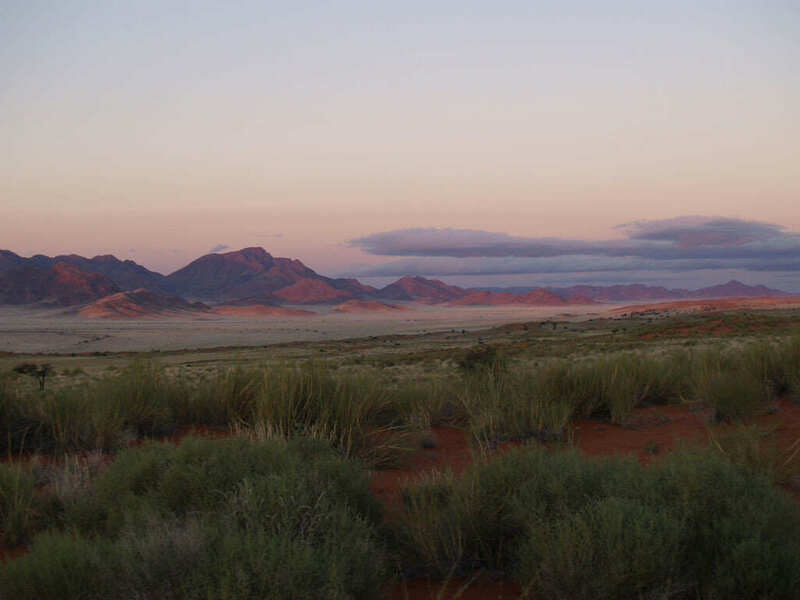 The world’s driest desert, the Namib, remains mild year-round. During the summer months, from November to April, is when temperatures are quite hot, but can drop below freezing at night. This time of year is also when the rain falls inland. Spring and fall are pleasantly warm, but fall often brings dust storms. And finally, Namibia winters can be fairly cold, but the days are generally warm and enjoyable. Most visitors enter Namibia through the Chief Hosea Kutako International Airport, located 45 km east of Windhoek, Namibia’s capital. A number of carriers, including Air Namibia, arrive at the airport multiple times a week. Flights from Toronto and Vancouver fly there regularly, usually with either two or more stopovers en route. But if you’re already in Africa, there are several domestic airlines you can take that are serviced by Windhoek’s Eros Airport. There are a myriad of ways to get around Namibia, but by road is the easiest. Namibia actually has a great road system that runs the length of the country from the South African border to the Botswana border to the Angola border. The least-expensive car or motorcycle rental will cost you between $40 and $80 CDN a day. A compact car or motorcycle will do fine on C-numbered highways, but you’ll want a larger 4WD vehicle if you plan on taking D-numbered roads. You can rent a car through a trip operator or tour company. If you would prefer to avoid the hassle of renting a vehicle, many tour companies in Namibia also provide transportation services. Public transportation is another option. Namibia’s two main bus services, the Intercape Mainliner and Trans-Namib’s Star Line, leave from Windhoek to various cities within the country. You should never underestimate a country’s capital city, especially Windhoek. Also known as a very clean city, Windhoek is located 1,680m above sea level in the Khomas Highland plateau area at the epicenter of the country. Namibia’s capital offers many guided tours that help you explore its impressive views and German colonial architecture. Windhoek has preserved a number of historic buildings, cemeteries, military forts, and churches that can all be explored today. There are also tons to do. Just a few kilometres north of the city lies Windhoek’s Soweto Market, an interesting marketplace where you can buy just about anything. But if shopping does not appeal to you, the city also offers tours of all kinds: boat cruises, walking tours, and safaris. The city has a café culture by day and by nightfall boasts a growing nightlife scene with many restaurants, bars, and clubs to explore. Etosha National Park is one of the world’s greatest wildlife viewing venues. At more than 22,000 sq. km, the park is home to 114 mammal species, 340 bird species, 16 reptiles and amphibians, and one fish species. Located just north of Windhoek, visitors are invited to see some of Africa’s greatest wildlife. Lions, cheetahs, giraffes, and elephants can all be spotted, including several endangered species like the Black Rhino and the Black-faced Impala. Officially declared a game reserve in 1907, the park has been designed to include very good roads, lookout points, and rest stops in order to make wildlife viewing as easy as possible. The best time to visit is during the dry season, from June to November. Etosha National Park’s unique animal watching experience makes it a highlight of any visit to Namibia. Africa is full of many natural wonders, but its most impressive is Fish River Canyon. Over 1,800-feet deep, this canyon is 27 km wide and 160 km long, making it the world’s second largest after Arizona’s Grand Canyon. It is located at the bottom of Namibia, south of Windhoek. There, you can hike the 85 km route of the Fish River Hiking Trail. This hike takes approximately five days to complete, but allows opportunities to camp along the way. It begins at the main viewpoint at Hobas and ends at Ai-Ais, the location of a hot springs spa. Since the trail can be a strenuous and rugged journey for some, the government of Namibia requires hikers to have a medical certificate of good health before entry on the Fish River Hiking Trail. Another reason is because, once in the canyon, it is impossible to get out. This means that in emergencies, hikers have to be airlifted out. Nonetheless, this trail is very popular and requires you to book ahead as it is only open from May to September. Namibia’s small Atlantic town Swakopmund is often characterized as being more German than Germany. Seeing as Namibia was a former German colony itself, this makes perfect sense. Swakopmund is located on the coast of northwestern Namibia and its beautiful beaches attract fishermen, surfers, and beach-lovers alike. The town also contains many historic examples of traditional German architecture, including the Alte Gefängnis designed by German architect Heinrich Bause. Built in 1909, this structure is often mistaken for an East German train station or a health-spa hotel, when in fact it was a prison. If you are less interested in discovering pieces of history, Swakopmund also appeals to adrenaline junkies as it boasts a number of adventure sports such as snowboarding the dunes and quad biking. And of course, Swakopmund stays true to its German roots by boasting its excellent beer! Because the Caprivi Strip is so oddly shaped, it is the most isolated, sharing its borders with four other countries: Angola, Botswana, Zambia, and Zimbabwe. Despite this, six ethnic tribes reside there, including the Subia, Yeyi, Mafwe, San, Tortela and Mbukushu, who have all adapted the Zambian language of Lozi. On the strip, visitors have the chance to learn about these tribes and of Caprivi’s unique history. The Strip also contains picturesque landscapes with lush forests and wildlife and four national parks: Bwabwata, Mamili, Mudumu, and Mahango. While all the parks are beautiful and tranquil areas, Bwabwata is the most unique. This is because the park consists of a large wildlife and human population, living harmoniously together. Here there are many opportunities for ecotourism to help the local Caprivian people’s long-term conservation initiative and to help improve their quality of life. With files from Jennifer Foden.